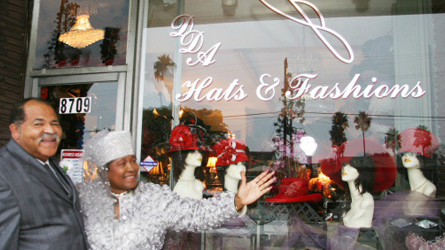 DDA Hats & Fashions of Los Angeles, California, got started in the business many years ago by designing our own hats. Everyone was so enamored with our exclusive, captivating hats that we began selling them from home. The business soon evolved into a brick and mortar store. Today we have just the unique hat for you. We are delighted to report that we have been in business since 1990, and it has always been our goal to provide quality designer hats and suits that are unique, stylish, and affordable. We take pride in making sure that our hats and suits are designed for every personality and every event. We carry dressy church hats and casual hats, sorority hats, and Kentucky Derby hats as well as casual and elegant clothing, sparkling jewelry, and purses. Visit our site on a regular basis and watch for our special promotional discounts. We know that our designs, styles, and colors will ensure that all heads will turn when you walk into a room.